Nanette Lepore is one of my personal favorite designers and if I had a magic fashion fairy, hers is the collection that I would wish to appear in my closet come fall. Inspired by her love of all things vintage and “Tarot reading with Oscar Wilde” Nanette Lepore‘s collection showcased rich colors and gorgeous prints to evoke the perfect vintage bohemian vibe. 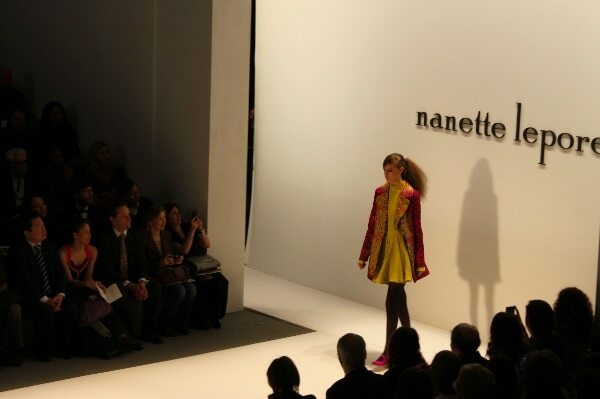 The Nanette Lepore show began to the Beatles When I Saw her Standing There which perfectly set the tone for the vintage tableau about to unfold. The star-studded front row included Stanley Tucci, Kristin Chenoweth, Matthew Settle and Kelly Rutherford. 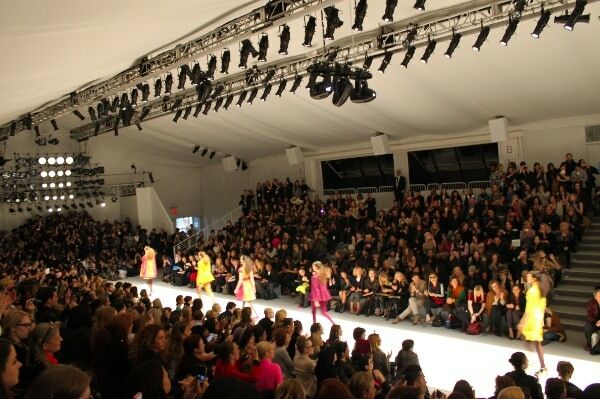 The collection was an explosion of color featuring deep burgundy, peacock blue, gold and chartreuse. 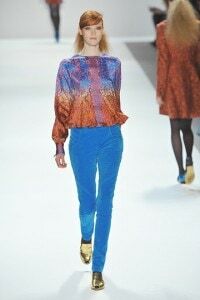 The brilliant color palate was paired with vibrant prints which complimented, rather than competed with the dynamic color palate. The collection also included gold metallics which paired beautifully with the deep burgundies and blues that made up the rest of the collection. Overall, Nanette Lepore‘s Fall/Winter 2012 colletion was a modern update on its dandyism inspiration and the effect was a very wearable collection that is sure to turn heads and inspire fashion envy in those around you. As if this amazing collection wasn’t enough of a reason to adore Nanette Lepore, she is also a vocal supporter of the Save the Garment Center organization whose mission is to “Promote, Preserve and Save New York City as the Fashion Capital of the World.” Did you know that all of Nanette Lepore‘s lines are all made right here in New York City? Go to www.savethegarmentcenter.org to learn more and see what other fabulous designers continue to manufacture their lines right here in New York City.